The architectural practice, founded in 1974, proposes itself as a space for research and multidisciplinary involvement, with particular interest in the development of a pure element linked to shape, culture or artistic representation, as an instrument to link people, architecture and landscape. The architectural production encompasses a varied range of projects, from large and small landscapes interventions, to interior design for both home and commercial activities. Amongst projects listed are international proposals, participation in several competitions, and private commissions. Luca Cerullo, graduated in architecture at the University of Florence and The Seville School of Architecture. He, moved to Barcelona in the same year where he worked with the Carles Ferrater Partnership (OAB). In 2005 he opened his own studio in Barcelona, expanding the family practice originally opened in Florence in 1974. He has developed and worked on architectural projects and urban planning, and interior design for both public and private customers. He directed and produced a videoclip which won 1st prize in a National Competition entitled “City and environment”. In 2014 he won 1st prize: “NIB ARCHITETTURA 2014” a competition that rewards the professional trajectory of the most promising architectural firms under 36 , and who are ambassadors of the quality of ‘Made in Italy’. He was invited to be a member of the faculty of MASTER OF ARCHITECTURE-ENVIRONMENT in Salerno, Italy. In 2015 he was selected by the NATIONAL INSTITUTE OF ARCHITECTURE and MINISTRY FOR ECONOMIC DEVELOPMENT as a professional representing of the quality of ‘Made in Italy’ abroad. In 2016 he won the tender by “Rehabilitation EMCCAT Award” to complete the renovation of HOTEL CAN MOIO in Mallorca. Italo Cerullo, studied architecture at the University of Florence, where he graduated in 1974 with a first class degree. Architect and sculptor, he is a qualified Master of Art and author of numerous plastic and graphic works. He is a Professor of Applied Arts, and teaches furniture and ceramic production techniques. 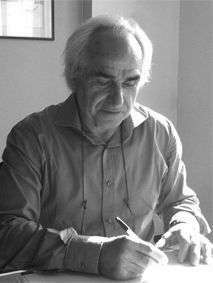 He started his architectural career as executor of projects of private villas in the Florence area, interpreting the design of all the elements in an individual way. Later he also developed an interest in architectural restoration for which he moved to Paestum, where he developed different projects in the archaeological sites with a focus on the protected areas. Due to his ability to integrate with the environment he accomplished several noteworthy environmental recoveries.